During the summer months is when the BBQs come out and everyone enjoys a bit of alfresco cooking. But even though BBQs are enjoyed by many, not everyone is entirely sure if the meat they are cooking is actually cooked correctly. This is why the Superfast Thermapen is the perfect gadget to have this summer. The Thermapen is a fantastic gadget that tells you simply and quickly if the meat you are cooking is cooked properly. I have tried the Superfast Thermapen 4 when I have done a BBQ for family and friends and I think it is amazing. This Thermapen 4 uses advanced technology and includes a number of innovative features. It has a patented automatic 360° rotational display that can be used in any position and in the left or right hand. It also has an intelligent backlit display that senses light levels and will automatically turn the backlight on or off in varying light conditions. The motion-sensing sleep mode also automatically turns the Thermapen 4 on/off when set down or picked up which maximises the battery life. The Thermapen is also waterproof to IP67/67 and has a washable casing that includes ‘Biomaster’ additive that reduces bacterial growth. The ergonomic rubber seal minimises the risk of the ingress of water, dust or food. The Thermapen 4 measures temperature over the range of 49.9 to 299.9 °C and is powered by a single AAA battery with a life expectancy of 3000 hours in normal use. The Thermapen 4 offers the perfect combination of speed, accuracy and convenience of use. It is a great gadget to have with you when you are barbequing meat and once you have used it you will wonder how you ever cooked without one. 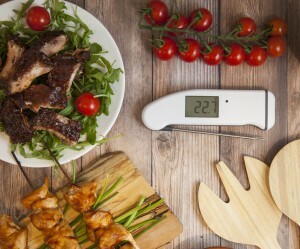 The RRP for the Thermapen 4 is £64.80 and it is available from www.thermapen.co.uk.